Restoring confidence: Satyam’s independent director Vinod Dham. 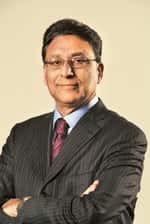 Bangalore/Hyderabad: In a sign that influential board members of Satyam Computer Services Ltd have decided to step in and take charge, independent director Vinod Dham said a board meeting next month would discuss a change in management, including the possible exit of chairman B. Ramalinga Raju, and induction of a professional chief executive or even a sale to another entity. Breaking his silence on Satyam’s aborted takeover of Maytas Infra Ltd and Maytas Properties Ltd, Dham told Mint that the 10 January board meeting would also review steps to improve governance standards to shore up investor confidence. “All of those options are under discussions... There are some issues that I know of, but there are some others that I am not aware (of)," Dham said in a phone interview from the US on Saturday night. Known as the father of the Pentium chip, Dham has been on Satyam’s board since 2003. A Satyam spokeswoman said the steps outlined by Dham were possible, “but (it) is all conjecture till the board takes a decision". Satyam’s board was to meet on Monday to discuss a share buy back plan after the management aborted the decision to buy Maytas Infra and Maytas Properties. The company’s share price suffered a precipitous drop amid massive investor unrest over the planned purchase. Both the US-based independent directors, Dham and Krishna G. Palepu, a professor of business administration at Harvard Business School, who were party to the aborted plan, sought a postponment so that they could be present in Hyderabad for the board meeting. Initially, both of them were to be connected to the meeting through a video link, but Dham said it “would have been difficult to come to a conclusion deliberating through the call, as sometimes you miss out on some of the statements." “I understand there has been a lack of leadership. This should have been handled by the management better and (management) should have been more transparent," said Dham. “But the damage is done, and the best thing to do is to gain the trust of the shareholders and ensure that the jobs of employees are safe." Palepu could not be reached for comment. Dham said he was up till 2am in the US during the previous board meeting on 16 December in which, he admitted, the board took a hasty decision to diversify from its main business. The controversial move has led Satyam shares to lose nearly 41% of their value on the Bombay Stock Exchange. “It is a mistake. The best thing to do is to admit and correct it," said Dham, who said he would not follow the example of Mangalam Srinivasan, another independent director, in resigning from the board. Srinivasan, a director since 1991, resigned from the board, owning “moral" responsibility for questioning the deal at the board meeting but not eventually voting against the proposed transaction. Dham is the founder and managing partner of IndoUS Capital Llc., a US venture capital firm that invests in early and late-stage firms in India. On Saturday night, Satyam said it had appointed DSP BlackRock, formerly DSP Merrill Lynch, to review the firm’s strategic options to enhance shareholder value. At its 10 January meeting, the board will also decide on a possible dilution of the stake of the promoters, led by Raju, who own an 8.6% stake in the firm. “Satyam takes the interests of its stakeholders very seriously, and we will take whatever steps are necessary to reinforce their trust and confidence in the company," Raju said in a statement. Satyam, meantime, backtracked on an earlier statement and said it will now meet Monday’s deadline for submitting the minutes of the 16 December board meeting to the Registrar of Companies (RoC). On Saturday, Mint reported that the firm would miss the RoC deadline and seek additional time to submit the minutes and related documents, based on comments by G. Jayaraman, Satyam’s company secretary who is also head of corporate governance. A company spokeswoman said on Sunday that “Jayaraman has (subsequently) confirmed that they will work day and night and put extra effort to meet the deadline." Two independent directors, T.R. Prasad and V.S. Raju, whom Mint spoke with, said they had not approved the minutes as of Sunday evening. According to a legal expert, unapproved minutes are not valid and usually not accepted for official purposes. “Customary practice is for the chairman to sign off on the minutes after the draft of the minutes is circulated to all board members. If nobody disagrees with the minutes, then the chairman approves it," said Anand Prasad, partner at Delhi-based legal consultancy firm Trilegal. Andhra Pradesh RoC Henry Richard could not be reached on Sunday to verify whether unapproved minutes would be admitted by his office.